Rainwater is directly harvested for domestic (household) consumption in more than one hundred countries, both in arid regions where water is scarce, and in humid regions where precipitation is easily captured. Rainwater harvesting systems reflect the diversity of Earth's many societies, climates, and regions. Systems can be designed quite differently, use a variety of materials, satisfy an array of performance requirements, and have different cultural impacts. Archaeological excavations document ancient rainwater harvesting in Mesoamerica , the Mediterranean, and the Orient. Today, rainwater is harvested by both traditional technologies and optimally engineered facilities. Traditional rainwater harvesting systems include a rooftop and adjacent cistern. Improved systems include paved hillsides, airport runways, subterranean reservoirs, disinfection, and automated monitoring. Computercontrolled systems are used in parts of Japan and Scandinavia. Some method to draw upon the storage for consumptive use . Rainwater harvesting can help improve the lives of women and children in traditional societies where the domestic water supply would otherwise require daily travel to distant wells or streams. 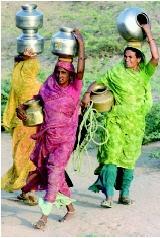 These Indian villagers, carrying vessels of water over several kilometers, could potentially benefit from rainwater as a supplemental supply. 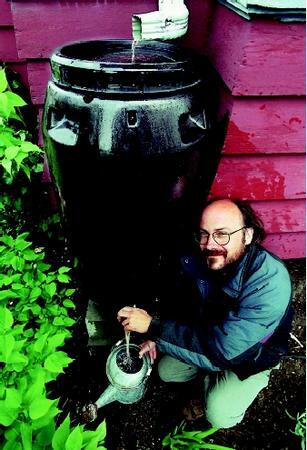 A rain barrel is a simple method of collecting rainfall pouring from a downspout. The stored rainfall can then be drawn out and redirected to specific uses. per year provides, on average, 274 liters (71.2 gallons) of water per day. This amount is roughly 75 percent of a typical North American person's domestic consumption, 180 percent of a French person's average, and nearly seven times the per capita average in some developing regions. Alternatives to roof catchments include airport runways in the Pacific Islands, paved hillsides in the Caribbean, and earthen courtyards in China. The cistern, whether a clay pot in Thailand or a reinforcedconcrete community reservoir in Kenya, provides the rainwater system the capacity to function through droughts. Not all storage is in tank cisterns. Hand-dug mortared subterranean vaults are found in the Middle East. Japanese construct rock-filled containments beneath ground to serve as artificial aquifers into which intercepted rainwater is directed for subsequent pumping. The less uniformly that rainfall occurs over a year, the greater the required storage volume. It is not uncommon for cisterns to be sized to hold a 30-day water supply. Cisterns in Australia can store a half-year's supply accumulated in the monsoon season. Cisterns of only a week's capacity may be sufficient in the tropics. Because droughts are unpredictable, rainfall harvesting always carries with it some degree of risk. Roof gutters are the most common conveyances between catchment and cistern. Rainwater harvesting often fails to achieve its potential yield because an adequate catchment is linked to an adequate cistern by an inadequate water trough that is undersized or poorly maintained. Cisterns from which water is hand-drawn by a dipper are prone to human contamination . Better systems are elevated so that water may be drawn down to the user by gravity. Urban Singapore has systems in which rainwater is pumped into an elevated tank for pressurized distribution. Where drinkable water is available from another source, but in limited quantity, rainwater can be employed as greywater . A separate rain-fed pipe network services toilets, laundry facilities, and lawn irrigation. Not all rainwater harvesting is for domestic supply. Traditional aridland agriculture captures infrequent rainfall through landscape improvement. Iranian farmers construct berms in the shape of an uphill "v" in order to funnel rainfall to individual trees. Native Americans terrace cornfields to capture infrequent summer thunderstorms. Water quality issues change with each rainwater harvesting system component. Some harvesting systems are biologically contaminated on the catchment surface, particularly at the "first flush" of storm runoff. Moreover, no effective shield can guard against airborne particulates or occasional bird droppings. But although catchment runoff may violate some quality standards for modern urban water supply, it is rarely pathogenic (diseasecausing) and may be less of a health hazard than the pollution in local surface waters. If pollution does occur, it most likely originates in the cistern. Uncovered reservoirs can breed algae or mosquitoes and can be contaminated by humans. In rare instances, minerals may leach from cistern walls. Where technology permits, in-line disinfection (typically chlorination) protects potable quality. Inasmuch as a high-quality water supply is a challenge to every society, rainwater harvesting is experiencing a revival in the economically developed world. Public agencies are increasingly promoting construction standards and water quality criteria in order to appropriately utilize rainwater as an additional water resource. SEE ALSO Developing Countries, Issues in ; Drinking Water and Society ; Reclamation and Reuse ; Supply Development. Gould, J., and E. Nissen-Petersen. Rainwater Catchment Systems for Domestic Supply: Design, Construction and Implementation. London, U.K.: IT Publications, 1999. Pacey A., and A. Cullis. Rainwater Harvesting: The Collection of Rainfall and Runoff in Rural Areas. London, U.K.: IT Publications, 1986. Fog can be harvested for domestic water supply. However, it takes 10 million fog droplets to form a matchhead-size drop of water. In light winds, these miniscule droplets travel almost horizontally. The droplets precipitate when they come in contact with solid materials. Oversized volleyball-type nets of polypropylene mesh have been used to harvest 3 to 9 liters per day per square meter of mesh in coastal communities of Chile and Peru. Fog is most effectively harvested at altitudes of 400 to 1,200 meters where stratocumulus clouds drift against mountain slopes. Fog harvesting is a potential water source in thirty countries worldwide. it was a good article but needs to add some more informations.